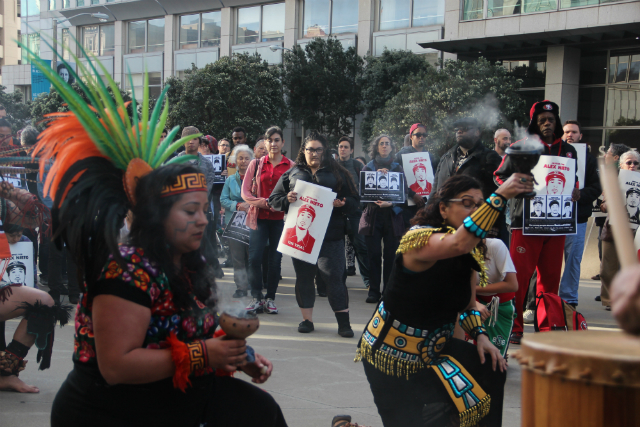 Aztec dancers surrounded by more than 150 people outside the federal courthouse on Tuesday. Photo by Joe Rivano Barros. See Mission Local’s full coverage of the Alex Nieto shooting here. Antonio Theodore, who says he was in Bernal Heights Park the day Alex Nieto was shot and killed by four San Francisco police officers, took the stand in a civil trial today and testified that Nieto never took his hands out of his pockets during the incident. Theodore also said police shot Nieto, watched him fall to the ground and then continued to shoot at him while he was down. Four officers are on trial in U.S. District Court in a civil lawsuit brought by Nieto’s parents seeking unspecified damages for the wrongful death of their son and for civil rights violations. In his testimony Thursday, Theodore — a Trinidadian singer with the group Afrolicious — said that Nieto had his hands in his pockets the entire time and did not make any movements towards his waist. He also said the only command he heard from officers was one “Stop,” before they started firing and said he heard nothing from Nieto, a contradiction of police testimony offered on Wednesday. Margaret Baumgartner, a deputy city attorney representing the four officers, said Nieto suffered wounds that would have been impossible had his hands been in his pockets, an issue that will be explored with expert testimony later in the trial. Theodore’s testimony on Thursday was dramatically different from that given by officers earlier. Three officers have taken the stand and all have testified that they fired at Nieto while he was aiming a gun at them. None mentioned a 45-second delay, but two testified that they reloaded their clips before continuing to fire. Adante Pointer, the lawyer for Nieto’s parnets, said there is no physical evidence he is aware of that would indicate “semiautomatic rifle” casings were found on the scene, as per Theodore’s testimony. So far, Pointer has only pointed to 59 shots from the officers’ police-issued .40-caliber handguns. Two of the officers involved have testified that they arrived at Bernal Heights Park, drove up a paved road, and stopped some 30 yards from Nieto, exiting their vehicles with guns drawn. The officers say they fired only after Nieto refused to show his hands, reached for his holster, and pulled up what looked like a gun. The defense ran out of time to examine the witness on Thursday but previously discounted his testimony during opening statements on Tuesday. Baumgartner said then that Theodore could not have accurately seen the incident from where he was standing because it was up a hill and far away. Theodore testified that he was some 115 feet away from officers when they shot at Nieto and admitted that he has a “mild astigmatism,” but said he was able to clearly see Nieto from where he was. Another revelation Thursday came from the testimony of Justin Fritz, the man who called 911 on Nieto and said he was almost hit by the barrage of bullets officers fired at Nieto. Fritz and his partner were in Bernal Heights Park walking their dog when his partner noticed Nieto shadowboxing and practicing drawing his Taser, Fritz testified, which prompted Fritz to call the police. Fritz said he only saw Nieto pacing near a bench and eating from a bag but did not himself see any weapon. When officers arrived at the park and shot at Nieto, Fritz thought the gunfire was heading in his direction and hitting the trees around him, he said on the stand. “Help!” Fritz said, testifying earlier that the bullets were “hitting the eucalyptus trees” around him. He also recounted a pause of 10-15 seconds between volleys of eight or nine shots each, which the plaintiffs said corroborates Theodore’s testimony. John Cagney, the homicide detective in charge of the Nieto investigation, also took the stand Thursday to address the irregularities in timestamps coming from Nieto’s taser. Baumgartner, a lawyer representing the officers, called this a common correction but did not say how much clocks usually drift. Nieto’s taser was 7 minutes and 24 seconds slow, she said on Tuesday. Pointer disputed that fact on Thursday and asked Cagney why two different time logs were created regarding the internal clock. “I don’t know if there was one report or two reports or how many reports Taser has in regards to this evidence,” Cagney said. Outside the courthouse, Pointer worried about a “lead investigator [who] didn’t know much about this taser” and said the conflicting records raise questions about the integrity of the evidence. On Friday the medical examiner who performed Nieto’s autopsy will take the stand, along with other expert witnesses and possibly Nieto’s parents, Refugio and Elvira. The trial is expected to last until Friday of next week. This story has been updated with additional details since it was first published.